Peyton was born in 1998, and Parker 14 months later in 1999. We went everywhere, and the boys endured many test to be diagnosed. They were originally diagnosed with pediatric neurotransmitter disease and started medications that would help with that, but they didn't make the improvements they should have. We did however feel that the medications helped some so we continued with that. The boys were finally diagnosed with PMD, in 2012, a year and half after Peyton passed. 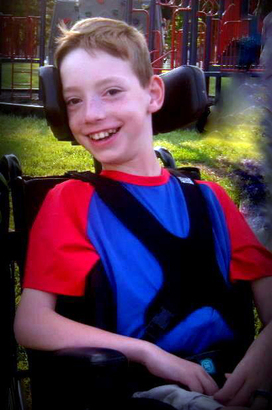 Peyton passed two month before his 12th birthday after a valiant fight against pneumonia. He was truly a bright light in our family and to all who met him. His SMILE was AMAZING! And he absolutely loved being involved in whatever was going on around him. He was emotional as well, when we'd read birthday cards to him or sang the birthday song, he'd put out his bottom lip, his eyes would turn red and skin blotchy and he'd start crying. He loved organization and having jobs such as putting the Tupperware containers in a drawer after they were washed. He would even get mad if I did it for him. He also loved to go shopping. Parker who just turned 17, in August is a strong willed determined young man as well. He loves knock- knock jokes! He thinks it's funny if you stub your toes, fall down, or accidentally hurt yourself. A huge sneeze will also get a smile out of him. He loves action, fast movement, he isn't very happy when that stops and isn't afraid to let you know. He enjoys TV, his favorite shows right now are SpongeBob, iCarly, Drake & Josh, and the old Franklin series. His favorite movies are the old time Disney movies, like 101 Dalmatians, Peter Pan, Charlotte's Web. ​Both boys attend public school and have been in a all inclusive setting since preschool. We fought hard for this, but it paid off with having extremely close life long friends! They've been invited to Birthday parties, sleep overs, and have them as well. Both were in Cub Scouts through fifth grade and loved participating in Pine Wood Derbies. Both won many trophies over the years. They also love to go fishing! We have a small pontoon boat that their chairs fit perfectly on. Both also love sports! Chicago Cubs, Nebraska Huskers. In fact their dogs name is even Wrigley, and they have a mural of Wrigley Field on a wall in their bedroom! Even though Peyton passed away in his 6th grade year in school, his classmates stayed very close with our family throughout their remaining school years. They also helped raise funds for the Peyton Hoffman scholarship fund. The class President, spoke about him in her speech, saying that "even though he never spoke a word to us, Peyton taught us about JOY", and added "let's go out into the world and do everything with pure Joy!" This year we presented his class with 18 scholarships, ten of those were $500 scholarships and the other eight were $1000 each. We miss Peyton dearly, and adjusting to life without him has been a struggle but we're getting better everyday. Parker is the light of our lives and shows us daily what it takes to live in a PMD body. We admire him greatly!! God blessed us with these two AMAZING boys and we will forever be grateful!